OpenOSX announced WinTel 3.0 on Thursday, the latest update to the company’s program allowing Mac users to run other operating systems on their computers. Version 3.0 brings with it, for the first time, virtualization features that speed up the performance of hosted operating systems on Intel Macs. 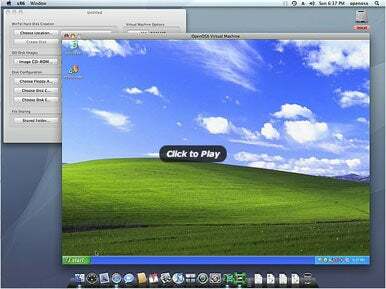 WinTel also runs on PowerPC machines, though it does so through the slower method of emulation. Included in the WinTel package are 10 ready-to-use disk images of popular open-source operating systems such as Ubuntu Linux, FreeBSD, OpenDOS, and more. The latest update to Late Night Software’s Script Debugger delivers several stability and performance improvements to the AppleScript editor. Late Night says the update released Thursday also tackles maintenance issues related to the 4.5 release. In the newly released 4.5.3 update, Script Debugger pastes object specifiers as a series of nested tell blocks instead of as one long object reference. Users can turn this behavior on and off via a new setting in the Editing preferences panel. Script Debugger 4.5.3 also features an improved Balance command and the auto-closing of AppleScript blocks. To correct a terminology conflict that caused AppleScript to rewrite “file spec” as “file” after compiles, Script Debugger 4.5.3 renames the “file spec” document as “file.” Other fixes tackle a problem where references to “path” outside a tell block produced incorrect four-character codes and a hanging bug when exploring the InDesign dictionary. For those looking to upgrade the memory in the latest MacBook Pros unveiled by Apple earlier this week, Other World Computing announced on Thursday that it’s offering RAM upgrade chips for the notebook computers, which max out at 8GB. The DDR3 1,066MHz modules are available in 2GB and 4GB capacities, allowing combinations of 1x2GB ($38), 2x2GB ($68), 1x4GB ($330), 6GB (1x2GB and 1x4GB, $365), and 2x4GB ($637). The upgrades are compatible with the 13-inch, 15-inch, and 17-inch MacBook Pros.